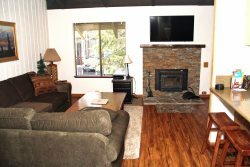 One Bedroom & One Bath Pet Friendly Condominium located in the Scenic Meadow Area of Mammoth Lakes. Sleeps up to 3 (approx.800 Sq. Ft.). This spacious ground floor unit is all one level and there are no outside stairs to enter the unit. Corner unit is bright with lots of windows to let the light in and has a partial view. New Carpet and flooring installed November 2015. The Master Bedroom has 1 King Bed and 1 Twin Roll-a-way Bed. The Living Room does not have a sofa bed. There are 2 Flat Screen TV's, one in the Living Room and 1 in the Bedroom. Phone in unit 760-934-0393 with unlimited long distance provided and Wifi Internet access in the unit. There is one outside parking space available. Sunrise Condominiums offer a Spa, Seasonal Swimming Pool, and Sauna. Coin-operated laundry facilities located in the common area near the office. TOT LICENSE 807-SR14. My wife and I had to get out of our city for a bit of respite after dealing with quite a difficult time the weekend before. The condo provided just that for us. It was close to town and the ski lifts. We hit the slopes our first day and then an avalanche hit the second day, which effectively closed down all ski areas. It was nice to have a spacious place with a fireplace and cable TV to spend that second day together. It was also nice to be right next to the jacuzzi. We all go to mammoth during the winter to ski/snowboard, not really to sit around a condo. After an unexpected closing of ski areas the second day, we were more than happy we booked this place. Love this place come again soon hopefully thanks for letting us stay at your guys place. Everything was great! Awesome company to work with! Hi! We love Sunrise and Unit 14. We have stayed many times before, and we will have our little (25 lbs.) doggie, Henri, with us. Thank you! We had an incredible stay!! Lots of snow and a perfect Christmas Get away. We will be using your service again in the future.